Understanding how to use SUMIF and SUMIFS functions in Excel is easier than you think. However, in order to properly use each of these functions you first need to learn what are the parameters used for computation and the expected end result. After reading this article you will be able to use each of the functions with ease. SUM and SUMSQ are some of the most basic Excel functions. They are easy to use and there are no specific parameters or conditions required. SUM function adds up all the numbers and returns the total amount, while SUMSQ function takes the square value of each number and returns the total amount resulted from adding all the values. The syntax is the same for both functions. You can use numbers (like 5 or 11), cells (D1, F3, and so on), ranges or even cell or range names. Please keep in mind that you are limited to a maximum of 255 numbers. Now let’s dive in the actual formula and look at some examples of how to use those functions. To select the range you just need to select G2 and with your left mouse click pressed drag all the way down to G25. Then close the brackets (parenthesis) and hit Enter. You can also name a range of cells and use that name in the SUM function. For this example we have named G2:G25 as “Salaries” and used the formula =SUM(Salaries) to calculate the total annual salaries. The result is the same as in Example 1, the only difference is the method used for achieving this. In this case, instead of a single range we just picked the cells we were interested in and skipped the rest of the divisions. As you can see you can combine cells with ranges in the same SUM formula. However, this method is prone to human errors since it requires you to manually select the salaries of employees working in IT. This means that you can easily select a wrong cell or miss one that should have been included. This is when more advanced and versatile functions like SUMIF or SUMPRODUCT come into play. Another quick way to sum all the cells from a table is to use the Autosum option from the Excel menu. For this, all you need to do is select the cell underneath the last value on the column and press Autosum. You can also make a selection of the cells you want to add up and press the button. The Autosum option is available in the Home tab of the Ribbon, in the Editing section. Keep in mind that this only works with continuous ranges. This means that if you have an empty cell on your column Excel will only take into account the last range starting from the empty cell and ending at the bottom of the column. If you want to add up all the values from a column you cannot use the Autosum option since it will not return the correct value. Using SUMSQ we can easily calculate the square values from cells or range and sum all the values. In this example we have taken cells L9, L10, L11 and L12 and used the formula =SUMSQ(L9:L12). This can be translated into 2^2 + 3^2 + 4^2 + 5^2 = 4 + 9 + 16 + 25 = 54. Just like the SUM function you can use values, cells, arrays or a mix of those. For example, you can type =SUMSQ(2,3,A8,C11:C20) and the function will still work correctly. SUMIF and SUMIFS functions add more functionalities to the basic SUM formula by introducing selection criteria. This means that you can take a range and only add up certain cells, while completely ignoring the rest. The difference between the two functions is given by the number of criteria used. SUMIF searches the range using only one criteria, while SUMIFS can be used with as much as 127 criteria/conditions pairs. Please note the difference in SUMIF syntax. Since it only has one condition, the syntax is changed and the sum_range parameter has been moved to the end. This means that you first have to set the search criteria and only afterwards define the range where it should be applied. sum_range – The range containing the values to be summed. range1 – The range to compare against the first criteria. criteria1 – The criteria to use on range1. range2 – [optional] The range to compare against the second criteria. criteria2 – [optional] The criteria to use on range2. Note: Please keep in mind that each additional range used needs to have the same number of rows and columns. Otherwise, the functions will return an error. SUMIF and SUMIFS function support logical operators (>,<,<>,=) and wildcards (*,?) for partial matching. Furthermore, you can customize the input values for the criteria using Data Validation. This will allow you to use a predefined drop-down list in order to select which criteria you want to apply to your SUMIF or SUMIFS function. In cells J22 and J23 I have created a predefined list for the Division and Seniority level. By changing the values you can easily recalculate the total salaries for all the possible combinations. Creating a predefined list can be easily achieved using Data Validation. For this, all you need to do is go to the Data tab on the Excel Ribbon, and select Data Validation in the Data Tools section. 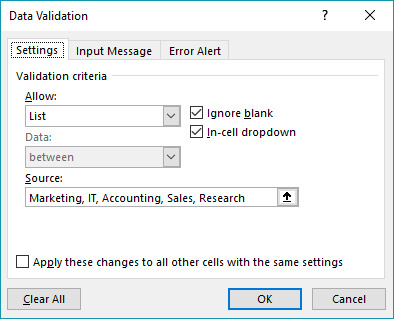 On the pop-up window select the Settings tab and pick List as the Validation criteria. In the source field you can insert your values separated by comma, select a cell range to create the list or insert the name of a predefined range containing the values you want to add you your list. Since we only have a handful of options I have pasted them as comma separated values and clicked OK.
You can customize the Input Message and Error Alert. These are optional but using them will help the users to better understand the purpose of your drop-down list and the error message in case they insert an invalid name. I hope that after reading this article you are able to to better understand how those functions work. In case you need more details or have questions on how to use them in your projects, please leave a comment and I will get back to you as soon as possible. If you have additional questions please let me know by posting a comment. If you need to calculate subtotals based on item type (or whatever common criteria), you can easily do so using the SUMIF function. If you are looking to create a breakdown of yearly sales based on a list of transactions you can use the SUMIFS function. Excel's EOMONTH function returns the last day of a month, N months in the future or the past. Step by step instructions on how to use COUNTIF function in Excel. Download the example workbook to better understand how to use COUNTIF. Join over 1,000 people who receive weekly Excel tips​. Yes, I want Excel tips! You will start receiving useful Excel lessons and tips. Excel is a very complex application and understanding it on your own may prove difficult and time consuming. I have created ExcelExplained.com to help you better understand each function and provide useful examples for different tasks. If you can’t find the answer to your question in one of the published articles, please leave a comment or send me an email and I will do my best to help you out. Learn how to work with functions, create complex formulas and design beautiful charts. All free.